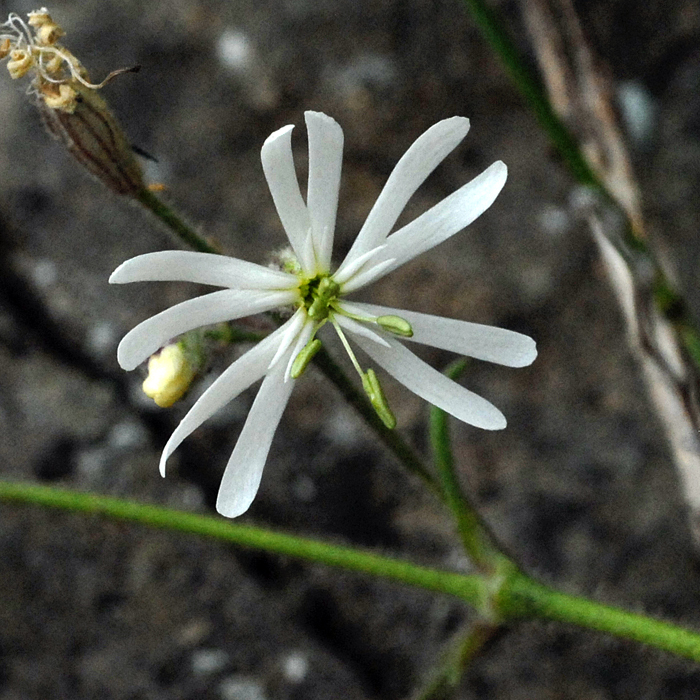 Silene nutans is a vespertine plant like many of the catchflies. This means that the flowers tend to stay closed in the daytime and open in the evening or at night. When you find Silene nutans it is nearly always with curled up petals like the one in the photographs on the left. When I first saw it I thought it has finished flowering so didn't bother to photograph it. Occasionally one flower (see below) gets the timing wrong and stays open in the heat of the day but not often. Wikipedia tells me that each flower opens three successive nights revealing one whorl of stamens on the first night and another on the second and the styles on the third. This thought to prevent self fertilisation. 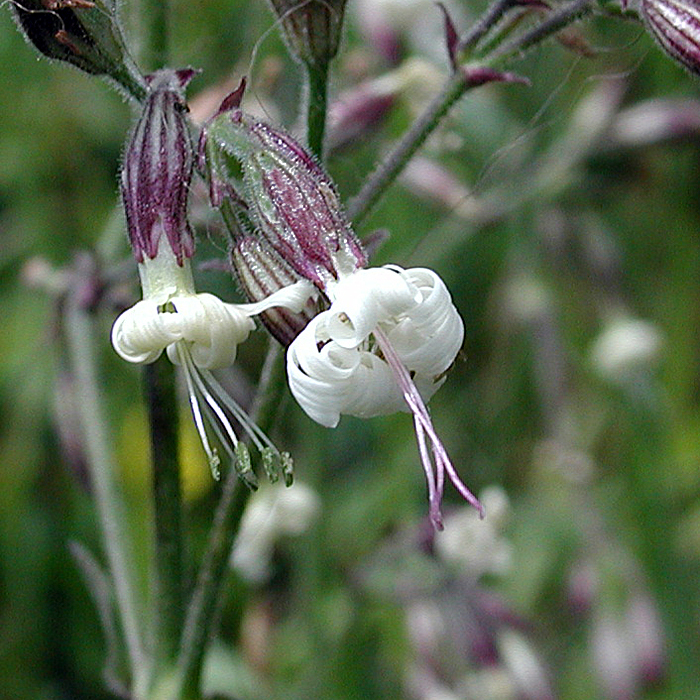 The common name Nottingham Catchfly was given because it used to grow in Nottingham on the walls of the castle. It no longer grows even in Nottinghamshire but here on the Great Orme it is locally abundant in some years on the limestone rocks - but you still have to know where to look. 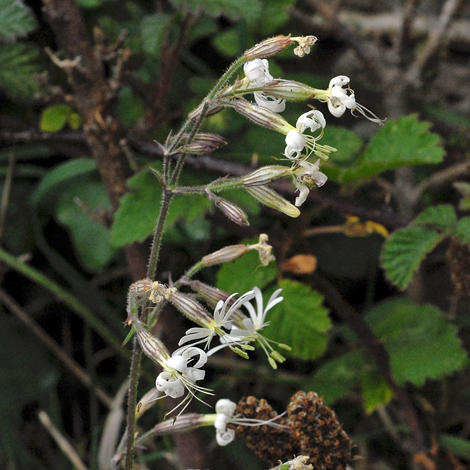 Silene nutans is found in little pockets all over England but never in large numbers over an area. 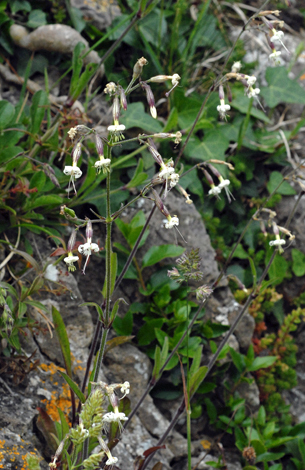 The two places where I have found it: Derbyshire and the Great Orme are Silene nutans hot spots. Otherwise there is not much in Wales even less in Scotland and only one record form Ireland.